Sitting in judgement on Canadian citizen and former child soldier Omar Khadr, Colonel Patrick Parrish wears his colours brightly on his sleeve. 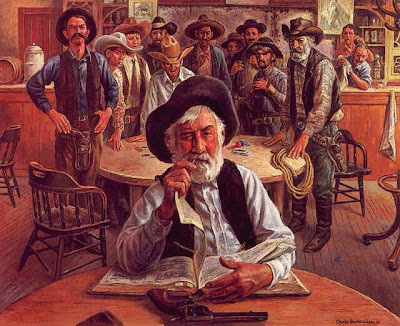 This latter-day Roy Bean has demonstrated bias from the get-go: he's plainly of the "first the trial, then the hanging" school of the American Wild West. As the presiding officer at Khadr's drumhead "trial," Parrish replaced Col. Peter Brownbank, who had fallen afoul of the military powers that be for allowing too many defence motions (e.g., permitting the defence to have access to the evidence). Parrish quickly proved more pliable: he immediately moved to ban photographs in court that Khadr's defence counsel at the time, Lt. Commander Bill Kuebler, considered vital evidence. Kuebler was blunt, when asked why Parrish had so ruled: "Because they show he's innocent." It didn't seem to pose a problem for Parrish, however, that the prosecution had already introduced doctored evidence against Khadr. Khadr is blind in one eye and has shrapnel in both. He has been suffering grievously of late, but no qualified medical assistance has been available to him in Gitmo. Parrish casually dismissed defence objections to his having to wear goggles while being transported to the court in a windowless van, and threatened to run the proceedings in Khadr's absence. Yesterday afternoon, Khadr was in court, in obvious physical pain. It should be no surprise to anyone, therefore, that Parrish has now ruled that the prosecution may introduce statements made by a 15-year-old boy under torture. "Tainted evidence" doesn't begin to cover this: "putrid" would be more apt. Parrish's very presence in a courtroom perverts the notion of justice. He is a disgrace to his office. But he will have his way. And Stephen Harper and his minions, who have been praying for this moment to arrive, will be delighted. "It's our intention and our hope during this trial to shame this judge -- which may be impossible," Edney said. "We hope we can shame the jury so they can really get a true picture of what Omar stands for." Good luck with that. Parrish is already twisting the hemp in his hands. And our own Prime Minister is part of the mob. This page contains a single entry by Dr. Dawg published on August 10, 2010 11:57 AM. Shaking down Greenpeace was the previous entry in this blog. Jenny Paycheck is the next entry in this blog.